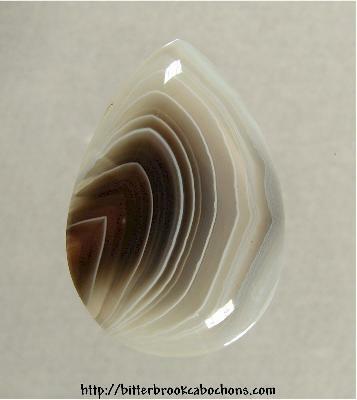 I found another small slice of Botswana Agate in my stash and found that a teardrop cut fit it very well! It was difficult to photograph, but you can see the sharp white layer edges in this pretty cab! Gloria at Wire Treasures wire wrapped this cab into a pendant; you can see it here! 31mm x 21mm x 6mm. Weight: 29.00 carats.